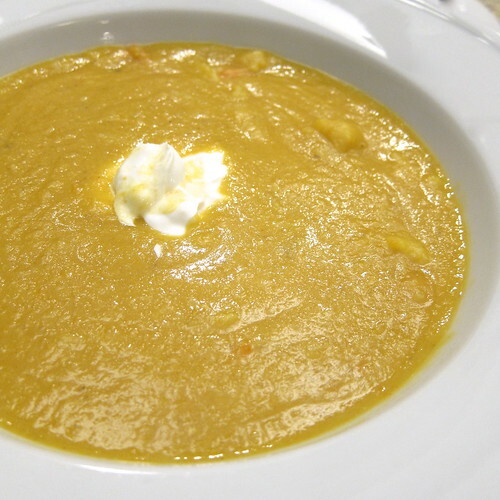 This is a gorgeous and flavorful fall soup. Even though it is very creamy, thanks to blending, there is no cream in it except the soup cream you garnish it with. Fresh ginger and a pinch of cayenne give it that touch of warm that is perfect for colder winter. Wouldn't that make a beautiful starter for Thanksgiving? 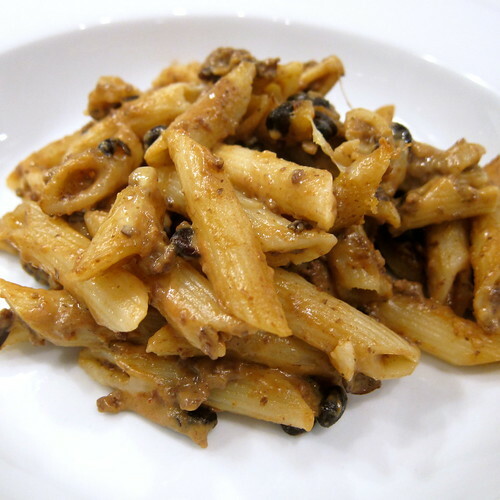 Or just great meal with some bread on a busy weeknight? It is really complimented with rolls or pretzels with poppy seeds on them. You can make this ahead of time too since I think it was even better a day or two later. In a large heat pot heat the butter and olive oil over medium hight heat. Add the onion and ginger. Sauté until the onion is starting to become translucent. Add all the remaining ingredients except the salt and sour cream. Bring to a boil. Reduce heat and simmer, uncovered for 20 - 30 minutes, until the vegetables and lentils are tender. Use an immersion blender, blender or food processor to blend to desired creaminess. We got our almost blended, but left a few chunks of vegetables for texture. Salt to taste. This was another dish inspired by leftovers and what was in the fridge. Basically, I had some roast chicken that needed to be used up, plus a head of cabbage. I don't know why, but that just seemed like a start to an Asian soup to me. Add the fact, I had some fresh ginger and my path was clear. The ingredient that really makes this dish is the Thai Sweet Chili Sauce. It gives it a wonderful sweet and spicy flavor (very mildly spicy). A touch of lime juice added a little but of needed sour. 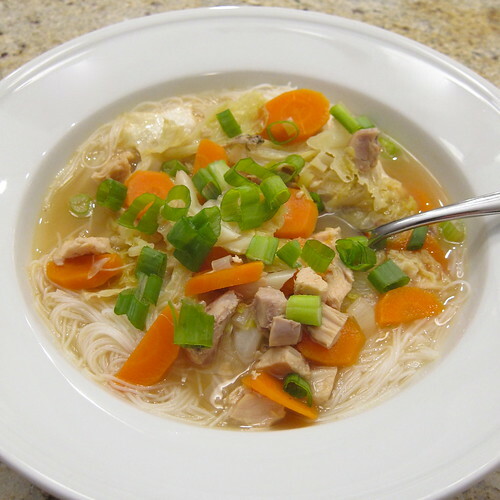 What you end up with is a different take on a comforting chicken noodle soup that has a great fresh, almost lightness, to it. In large soup pot, stir together the stock, ginger, white part of the green onions, carrots, Thai sweet chili sauce, soy sauce and lime juice. Bring to a boil. Reduce heat and simmer until the carrots soften slightly. Add chicken and cabbage. Cook until cabbage wilts a little. Taste for salt and add if needed. Meanwhile put the rice sticks into a heat proof bowl, I like to break them up a little. Cover with boiling water. Let sit for about 8 - 10 minutes until the noodles are softened, stirring occasionally. Drain the noodles and divide between bowls. Pour soup on top of the noodles. Sprinkle with green onion greens. It's Monday night and Matt and I haven't been to the grocery store in over a week. Time to see what I can create for dinner from the fridge and pantry. There's some leftover chili that needs to be eaten, but there isn't enough for two servings. What to turn it into? I also had some pasta and cheese (well, Velveeta, so kind of cheese), so decided to try a chili mac. This went over really well with Matt. It was cheesy and creamy. 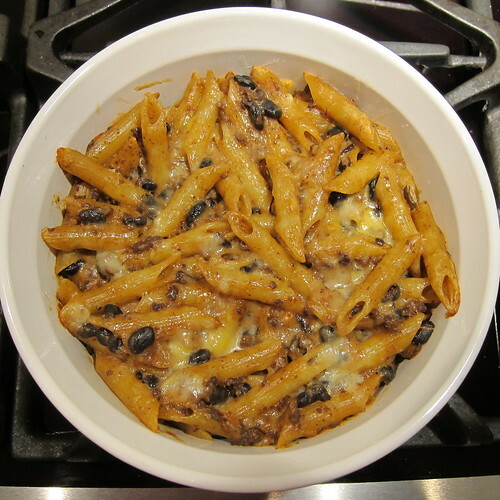 I'm torn a little on the beans in it, because there texture is a bit like the pasta, but Matt really liked them in it. It was definitely a good use of the leftover chili. Heat the chili. Cut the 6 oz of cheese into small pieces and melt into the chili. Stir in the milk and dry mustard. Now comes the optional part. My sauce was a little thinner than the cheese sauce I like to use for mac and cheese, so I whisked in the flour. I simmered the sauce while stirring for a few minutes until it was nice and thick. The chili you start with will really decided this for you. Mix the sauce with the cooked pasta and pour into a casserole. Grate a little sharp cheddar over the top. 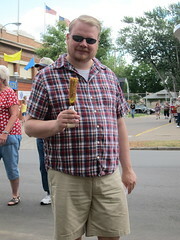 Thanks to dreadfully hot weather, we almost didn't make it out to the State Fair this year. Luckily, the last two days the temps dropped into the 70's, perfect weather for looking at livestock and eating fried food. After a lot of bad reviews on Heavy Table, we didn't bother to try all the new foods this year. Some we wanted to try had crazy long lines (the day we went broke the all time attendance record). So, we had a nice mix of new items, classic foods and a few new to use things. 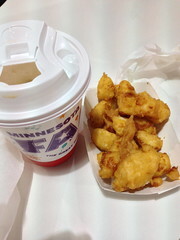 Breakfast was for the classics, Tom Thumb mini donuts, fried cheese curds, and just to make it a little more breakfasty, a latte. 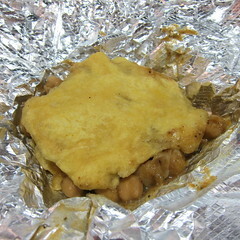 We topped that off with a Double from Harry Singh's, fried bread sandwiching curried chickpeas and chutney. This was taste and a break from fried foods. 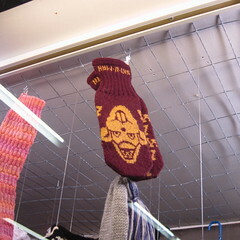 My Goldy Gopher mittens were on display, but I didn't take home a ribbon this year. Matt need a Prono Pup with mustard. 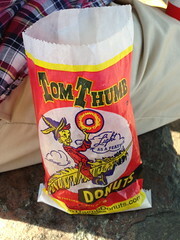 I still don't get the appeal of these, it just tastes like a hotdog covered in dough cornbread to me. 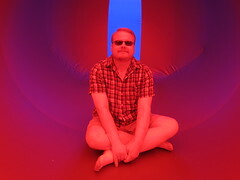 I was skeptical, but the Luminarium was actually really cool. 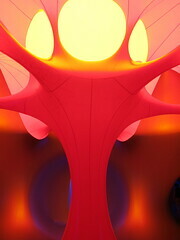 Bet it was the place to be during the hot days since they use cold air to keep it inflated. Comet corn was fun and tasty. 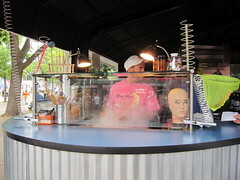 Carmel puffcorn is coated in PCP (parmesan, cheddar and pretzels) and then dipped in liquid nitrogen. It's a cold treat, but it's popcorn and it's smoking. We'd never tried Ollie's Cannoli's before, but had heard they were really good. 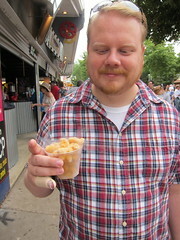 This year they offered one with candied bacon which both of us tried. 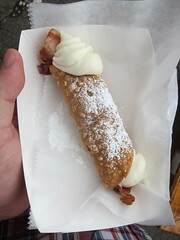 This is a really good cannoli, crunchy and sweet. Not sure the bacon added than much and next time I might just go more traditional. 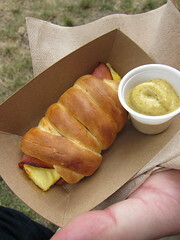 Loved the Hawaiian dog, pizza dough wrapped around ham and pineapple and cooked golden brown. Perfect with a side of mustard. 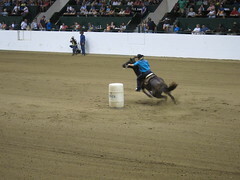 A little break from eating to watch some women's barrel racing and visit the Miracle of Birth barn. Then we found Izzy's Mini Donut Batter Crunch Ice Cream. Izzy's is our neighborhood ice cream parlor and we love their ice cream. This one was good, but I'm not sure I would have known it was mini donut without being told. I mainly tasted cinnamon. 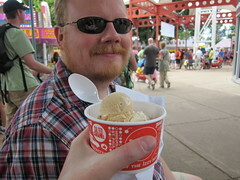 Of course it came with an Izzy's scoop on top, so we paired it with Salted Caramel. 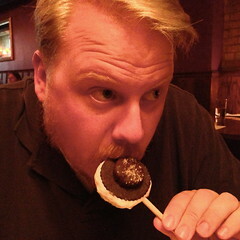 Then we headed for a glass of Lift Bridge's Mini Donut Beer. Guess we shouldn't have waited until 2:30 since they were already sold out for the day! 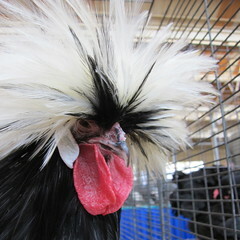 Ah well, we just contented ourselves with looking at the unusual chickens and headed home. We are in the midst of a record breaking heatwave here in Minneapolis. 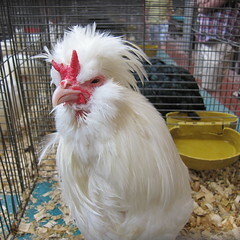 Temps in the 90's with high humidity have not made going to the State Fair very attractive. But, but we need our food on a stick! 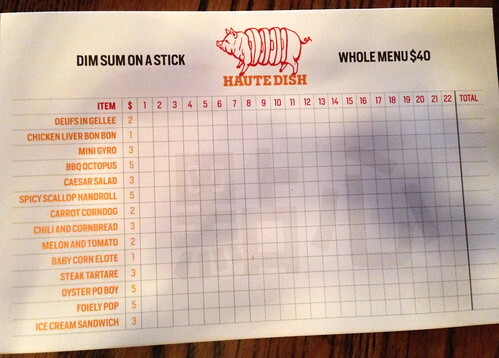 Luckily, one of our local restaurants, Haute Dish, is offering a food on a stick menu served dim sum style until August 29th in air conditioned comfort. 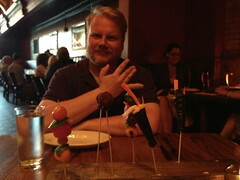 Matt flashed the broken finger sign behind our first three dishes, tomatoes & melon, chicken liver bon bons and spicy scallop handrolls. (In case you are wondering, he caught his finger in the door of the car.) 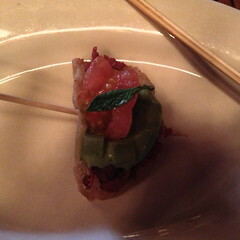 That was followed by a mini gyro (good, but maybe the weakest of the dishes of the night). The next two dishes were amazing! 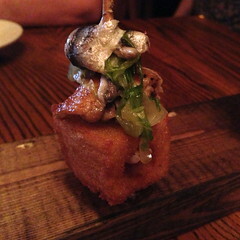 Caesar Salad on a stick was a fried piece of brioche with melted cheese in the middle topped with a chicken drumette and a pickled anchovy. The richness paired with the pickling was perfect. Then it was the Carrot Corndog, a sous vide carrot coated in classic corndog breading with sweet peppers and a sriracha sauce. If we hadn't been told it was a carrot, we would have sworn it was a hot dog, the texture was perfect! 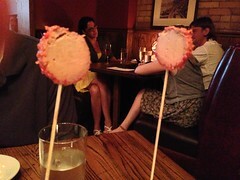 The servers called the next dish the most unusual, a foie gras lollypop edged with pop rocks. A fun pairing of rich and sweet with the special pop. 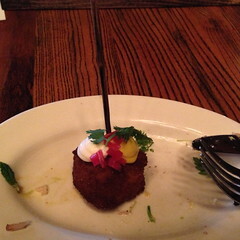 The egg in gelee had a great texture and flavor especially for fans of head cheese like me. That baby corn done elote with a cheese, salty sauce was so good we ordered another round. The chili and cornbread was a surprise. How they got real saucy chili into a fried square of cornbread crust I'll never know. Then came what Matt called the star of the whole meal, the BBQ Octopus. The Asian glaze with sesame seeds coated super tender octopus. 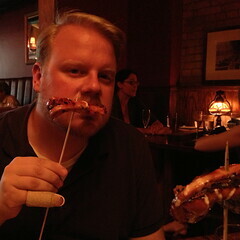 We were told the octopus was sous vided for 12 hours before it went on the grill. If we weren't so full, we would have had another round of this. 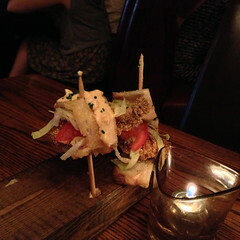 A mini oyster po-boy was done very classically with perfectly fried, cornbread crusted oysters. The mix of textured in this one was great. 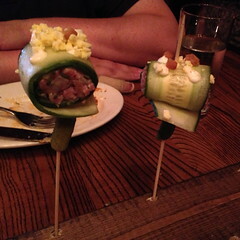 Our last dish was a classic steak tartar topped with grated egg and rolled in cucumber (one of our favorites for their regular menu). 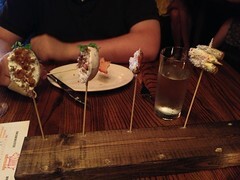 Everything ended with an ice cream sandwich on a stick, banana walnut ice cream between two chocolate cookies topped with a chocolate covered banana slice and a little peanut butter powder. I love frozen chocolate covered bananas and this sandwich tasted like just like a perfectly ripe banana dipped in dark chocolate. Matt and I had such a great time trying all the different dishes and enjoying our "fair food" without the crowds and heat. 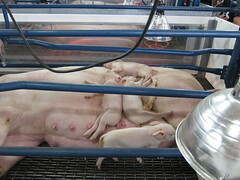 (Ok, we'll probably still go to the fair before it ends Labor Day.) 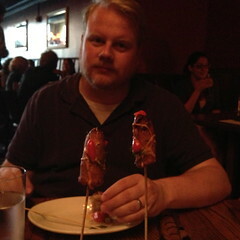 If you are in the Twin Cities area we highly recommend you get your yearly dose of food on a stick at Haute Dish.